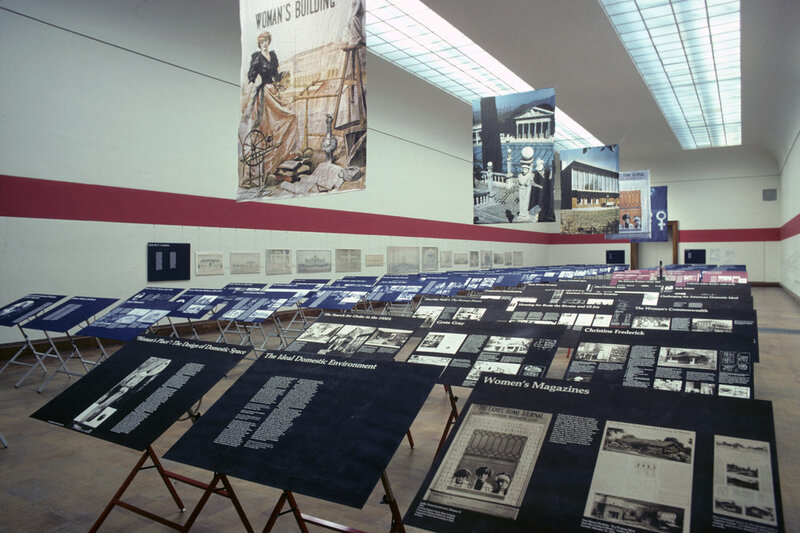 Installation view of Women in American Architecture: A Historic and Contemporary Perspective, Brooklyn Museum, 1977. Photo: Norman McGrath. Courtesy of Susana Torre. What was the significance of the exhibition and book Women in American Architecture: A Historic and Contemporary Perspective when they were being put together in the early and mid 1970s?1 We can look at this question through two lenses: First, the project's influence on professional practice and the discourse, and second, the relevance of the ideas it presented. Regarding professional practice, our main objective was to shake up the status quo that ensured the subordinate roles of women, thus initiating a change in the harsh conditions of women’s practice. We thought this could be best achieved by examining the history of the many invisible professional women working in the design disciplines from interior design to architecture and urban planning, albeit mostly in supportive roles. But we had another aim beyond rescuing the work of women architects from oblivion; we also wanted to show the opposing ideas of women designers and theoreticians. Some had been complicit in shaping the spatial distribution of homes and neighborhoods that continued women's domestic drudgery and social isolation, while others had presented and were continuing to present influential alternative designs to liberate them from those patterns.2 For this, we wanted to reintroduce housing and neighborhood design3 into the discourse of the discipline in the United States, which was at the time entangled in a pseudodispute4 between the so-called Whites, architects working on versions of Neo-modern design, and the Grays, followers and colleagues of Robert Venturi, interested in reintroducing history and context in design. The widespread attention the exhibition received in the national media and professional journals was critical in achieving these objectives. The New York Times published three articles, including a review by architectural critic Ada Louise Huxtable. Ms. Magazine, Newsweek, Art Forum, and other newspapers and art publications also provided prominent coverage. There was a special issue of Progressive Architecture—then a leading professional journal—exclusively devoted to the exhibition and book, earning the attention of gatekeepers in the professions. The initial exposure was further amplified as the show toured cities—traveling across the United States and the Netherlands for a full decade of after its opening. In each new setting, the exhibition changed with the addition of work by women architects in that city or region. Moreover, the exhibition panels could be printed as blueprints on demand, allowing schools of architecture to mount them inexpensively and to save the un-mounted panels afterward in their libraries as an oversized publication. In the first showing, at the Brooklyn Museum in New York, our targeted audience was the general public—we even included a portable playground by artist Sheila Berkley so mothers could bring their children, while in other cities the organizers generally aimed at more professional and academic audiences. The book published alongside the exhibition was meant as a freestanding project, not as a catalog. Seeing that no single scholar could write the ongoing history of women in architecture, I commissioned essays that would explore historic and contemporary issues, which I organized both by theme and time. The brief essays at the end of sections on specific individuals were included not because those women were exceptional, but rather as examples of the questions raised in the chapters. The collective result—a choral work on the history of the conditions of practice, the historical alternatives to those conditions, and contemporary conditions—emphasized the wide range of forms that women were exploring outside conventional professional practices. These included experiments with soft materials, collaborative design, a feminist critique of historical monuments, and theoretical investigations of matrix-like spaces. Forty years later, the book continues to be a reference for scholarly work on women in architecture.5 However, the expected changes were slowed by the political and economic contexts, not only in architecture but also in all social and cultural matters. The late 1970s and early 1980s were the beginning of the political era of conservative Ronald Reagan and anti-feminist Margaret Thatcher, both bent on cutting social welfare programs, privatizing industries, and reducing trade union power. Many college women believed, with Thatcher as prime minister, that women’s rights had already been won, and the limitations suffered by the women shown in our exhibition were no longer relevant to them and their careers. Some accepted the role of “token” woman, granted access to the opportunities and privileges enjoyed by men as individual exceptions, as long as they adopted the institutional values that continued to obstruct women’s professional development. Schools of architecture began to feature a few women in their lecture series, and professional associations like the American Institute of Architects included women, primarily in those positions and tasks that required a great deal of unpaid effort. Also, interview lists for prestigious architectural commissions used women as “window dressing” to show inclusion. But women almost never got the jobs after spending enormous amounts of effort and money to make themselves competitive, leading to bitter frustration and withdrawal from such experiences. Along with other publications in the late 1970s, the book and exhibition helped spur a movement toward the identification of women in architecture6 and their inclusion in historical surveys that continues to this day. This inclusion, however, has mostly been the type historians deride as “add women and stir,” little more than amplified tokenism that fails to challenge the continuing gender bias. And feminist ideas about interiors, buildings, and cities have been simply co-opted into the architectural discourses of the past decades without explicit acknowledgement of their origins. It is also important to recall how the exhibition's contents and installation design constituted a critique of exhibition practices at the time. The sponsoring organization, The Architectural League of New York, had assumed that it would include only a handful of "exceptional" women—those whose work would be acceptable to the dominant “one-at-a-time” access system. But the complex thematic/chronological structure of an exhibition that included urban design proposals of communistic societies and kitchen-less houses of the cooperative housekeeping movement, along with the built work of professional architects, obliged the sponsor to accept ideas well beyond the comfort zone of most of its board members. The installation at The Brooklyn Museum also challenged architectural shows' exhibition standards. Instead of wall-mounted large photographs—sometimes in backlit boxes—and carefully crafted models—with brief labels identifying the architect and building’s name, date, and location—our exhibition consisted of 30 x 40 inch blueprint panels and a single conceptual model. The panels—inexpensive reproductions our bare-bones budget could afford—were mounted as the tops of drafting tables low enough for children to read, though the amount of text was more demanding than usual. Rejecting the “exceptional woman” approach, all work was treated non-hierarchically, though with extra panels for more prolific architects, such as Julia Morgan. The “drafting room” installation allowed viewers to follow a meandering path of their own selection rather than a prescribed linear order. The male board members of The Architectural League and other prominent New York architectural figures were not alone in their criticism of the structure of the exhibition and book. Members of our own Archive of Women in Architecture group also questioned them, having envisioned a show limited to professional architects on the “exceptional woman” model. Though they also wanted to use the exhibition as a tool for improving the work conditions of women in the professions and enlarging opportunities and recognition for them, they wanted to achieve these without challenging the professions’ values and structure, including men’s power in the assignment of unequal salaries and subordinate supporting roles. Indeed, the preferred model for exhibitions and publications in the following years continued to be that of the patriarchal institutions and professions, with activist alternatives seeking structural change receiving scant attention. The publications on women in architecture that appeared in print or online every six years or so, including biographical profiles with no in-depth discussion of the work, distinguished themselves from one another only by the different names of the women featured each time. Women-only awards created more recently to validate women’s work and professional trajectories in architecture simply reproduce the procedures and structure of similar awards controlled by men, in some cases including well-known male practitioners in their juries as the ultimate corroboration of value. These awards do offer validation in developing careers and obtaining commissions, demonstrating that the professional reputation of women is no longer exclusively dependent on men. Still, the award categories tend to emulate a structure of power that is male and hierarchical, unprepared to reward the ethics and aesthetics of collaboration that characterize feminist design. New structures of practice and reward categories for excellence and exemplary work are needed to design and construct buildings and environments responsive to the needs and desires of people in all their diversity and to achieve recognition of the collective, choral voice that creates all works of architecture and urban design. 1 This essay is a response to that question, asked by the curators of Now What?! Advocacy, Activism & Alliances in American Architecture Since 1968, forty years after the opening of Women in American Architecture. A Historic and Contemporary Perspective. 2 The advocates that promoted the design of cooperative apartment buildings in New York without kitchens in the individual dwellings at the turn of the 20th century proposed one such alternative. Food preparation following the latest nutritional standards would be prepared in commercial kitchens such as the “Rumford Kitchen,” built by Ellen Swallow Richards as a demonstration at the Chicago World Exhibition of 1893. See Dolores Hayden’s A Grand Domestic Revolution, for more alternatives. 3 Martin Pawley trenchantly analyzed this situation in his 1971 book Architecture Versus Housing. 4 The passage of time has proved that this dispute had been a means for publicizing the work of architects in both groups, orchestrated by Peter Eisenman, one of the Whites, and Robert A.M. Stern on behalf of the Grays. 5 Fortunately, there will be soon a book on the history of women in architecture, authored by Andrea J. Merrett. 6 Wikipedia Edit-a-thon events organized by New York-based ArchiteXX, where volunteers help write female designers, architects, and planners into Wikipedia and the “Un Dia, Una Arquitecta” website, also staffed by volunteer scholars, are two major initiatives. Donations can be made via PayPal to hello@architexx.org or by check in the mail to ArchiteXX, 250 Cambridge St. Syracuse, NY 13210. As a registered 501c3 organization, we’re happy to provide tax receipt for your gift.